C and I were walking down a quiet street in Guangzhou when we came about a group of people milling about a food cart. I really could not see what the fuss was about but I decided to join the queue and just hope for the best. I was banking on the age-old theorem that states: Long Line = Good Food. As I got closer I could see that what was being sold were the insides of the cow cooked in a broth. There was some tripe, blood cakes, intestines, the reticulum, parts of the heart, and many other tasty bits. After questioning my queue mate further with my limited Mandarin, I gathered that what was being served was called Niu Chang or Niu Zha. This literally means “Cow’s Insides”. 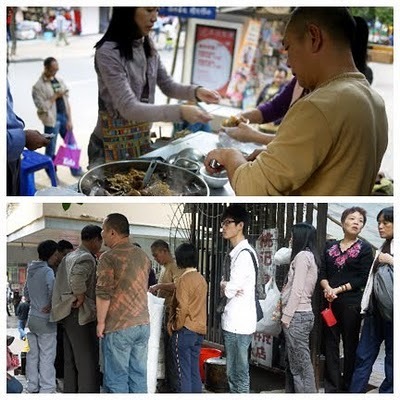 It is a common street side snack in the South China area including Hong Kong. Hong Kong serves a much tamer version. It could be because some of the parts are not as readily available. After waiting about fifteen minutes, I was able to get close enough to see the action first hand. The Vendor had a pair of tongs in one hand and a pair of scissors in the other. He would pick up different parts with the tong and cut little pieces from each part until you have 500 grams worth on your bowl. He then puts in a couple of scoops and broth and tops it off with a boiled potato. Add some chili sauce to taste and voila there you have it. I have to admit to some trepidation, especially after I saw the vendor pull out a whole jaw complete with teeth and started cutting a portion of the gums into the bowl. Also, there is the hygiene concern as well. However, buoyed by the long line of people, and thinking of what Andrew Zimmern would do, I soldiered on. I was pleasantly rewarded by a delicious and clean tasting snack. The different parts tasted like they were well cleaned, not too chewy and there was no gamey or funny tastes at all. It was excellent and, I would have eaten more but visions of spending the night next to the toilet or maybe even in a Chinese hospital, convinced me not to press my luck. I then rushed back to our hotel lounge to have a couple of shots of bourbon just for insurance. Cost for this tasty snack RMB13 or P88. mmm...offal. I've tried the so called tamer versions in the streets and dimsum places in HK. It's usually very heavily spiced to cover up any remaining gamey scent. Not sure if I can stomach the gums but I love tripe! Strangely enough, it wasn't spicy at all. In fact there was hot sauce served on the side for those who wanted their serving to be spicy. But even without the hot sauce, the absence of the gamey smells made it extra yummy. That is extreme eating! The offal in that pot is overflowing. But I guess it would taste good as I havent tried an offal that failed on my taste buds! I agree with you completely. 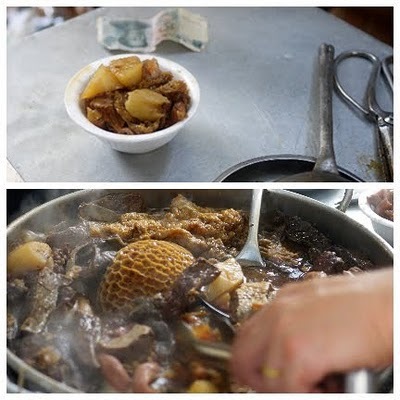 Although if offal is not cleaned and cooked well, it can be pretty hard to swallow.